A war memorial is a building, monument, statue or other edifice to celebrate a war or victory, or to commemorate those who died or were injured in a war. An important factor in the development of traditions of funerary art is the division between what was intended to be visible to visitors or the public after completion of the funeral ceremonies. The treasure of the 18th dynasty Pharaoh Tutankhamun, for example, though exceptionally lavish, was never intended to be seen again after it was deposited, while the exterior of the pyramids was a permanent and highly effective demonstration of the power of their creators. A similar division can be seen in grand East Asian tombs. 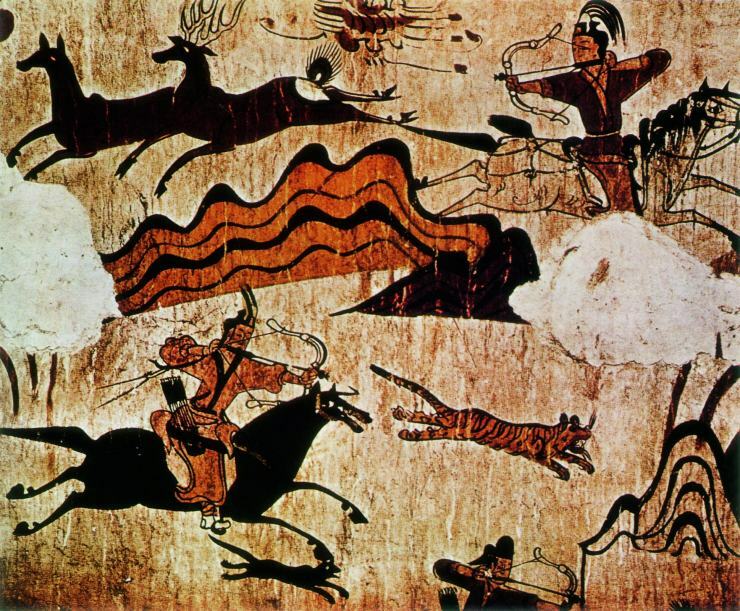 In other cultures, nearly all the art connected with the burial, except for limited grave goods, was intended for later viewing by the public or at least those admitted by the custodians. In these cultures, traditions such as the sculpted sarcophagus and tomb monument of the Greek and Roman empires, and later the Christian world, have flourished. The mausoleum intended for visiting was the grandest type of tomb in the classical world, and later common in Islamic culture. 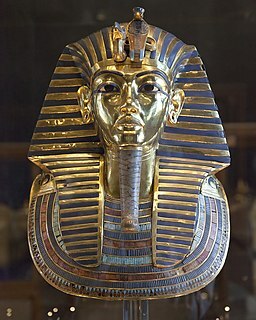 Tutankhamun was an Egyptian pharaoh of the 18th dynasty, during the period of Egyptian history known as the New Kingdom or sometimes the New Empire Period. He has, since the discovery of his intact tomb, been referred to colloquially as King Tut. His original name, Tutankhaten, means "Living Image of Aten", while Tutankhamun means "Living Image of Amun". In hieroglyphs, the name Tutankhamun was typically written Amen-tut-ankh, because of a scribal custom that placed a divine name at the beginning of a phrase to show appropriate reverence. He is possibly also the Nibhurrereya of the Amarna letters, and likely the 18th dynasty king Rathotis who, according to Manetho, an ancient historian, had reigned for nine years—a figure that conforms with Flavius Josephus's version of Manetho's Epitome. Tomb is a general term for any repository for human remains, while grave goods are other objects which have been placed within the tomb. Such objects may include the personal possessions of the deceased, objects specially created for the burial, or miniature versions of things believed to be needed in an afterlife. Knowledge of many non-literate cultures is drawn largely from these sources. John Weever (1576–1632) was an English antiquary and poet. He is best known for his Epigrammes in the Oldest Cut, and Newest Fashion (1599), containing epigrams on Shakespeare, Ben Jonson, and other poets of his day, and for his Ancient Funerall Monuments, the first full-length book to be dedicated to the topic of English church monuments and epitaphs, which was published in 1631, the year before his death. An epitaph is a short text honoring a deceased person. Strictly speaking, it refers to text that is inscribed on a tombstone or plaque, but it may also be used in a figurative sense. Some epitaphs are specified by the person themselves before their death, while others are chosen by those responsible for the burial. An epitaph may be written in prose or in poem verse; poets have been known to compose their own epitaphs prior to their death, as did William Shakespeare. Related genres of commemorative art for the dead take many forms, such as the moai figures of Easter Island, apparently a type of sculpted ancestor portrait, though hardly individualized. These are common in cultures as diverse as Ancient Rome and China, in both of which they are kept in the houses of the descendants, rather than being buried. Many cultures have psychopomp figures, such as the Greek Hermes and Etruscan Charun, who help conduct the spirits of the dead into the afterlife. Cremation is traditional among Hindus, who also believe in reincarnation, and there is far less of a tradition of funerary monuments in Hinduism than in other major religions. However, there are regional, and relatively recent, traditions among royalty, and the samādhi mandir is a memorial temple for a saint. Both may be influenced by Islamic practices. The mausoleums of the kings of Orchha, from the 16th century onwards, are among the best known. Other rulers were commemorated by memorial temples of the normal type for the time and place, which like similar buildings from other cultures fall outside the scope of this article, though Angkor Wat in Cambodia, the most spectacular of all, must be mentioned. Buddhist tombs themselves are typically simple and modest, although they may be set within temples, sometimes large complexes, built for the purpose in the then-prevailing style. According to tradition, the remains of the Buddha's body after cremation were entirely divided up into relics ( cetiya ), which played an important part in early Buddhism. The stupa developed as a monument enclosing deposits of relics of the Buddha from plain hemispherical mounds in the 3rd century BCE to elaborate structures such as those at Sanchi in India and Borobudur in Java. Regional variants such as the pagoda of China and Japan and the candi of Indonesia evolved from the Indian form. However, none of these can strictly be called tombs. Some important Tibetan lamas are buried in relatively small chortens (Tibetan stupas), sometimes of precious metal, inside or outside monasteries, sometimes after mummification. There are examples at Kursha Monastery in Zanskar and Tashiding Monastery in Sikkim, as well as the Potala Palace in Lhasa and many other monasteries. However, most chortens do not function as tombs. In the late Middle Ages, influenced by the Black Death and devotional writers, explicit memento mori imagery of death in the forms of skulls or skeletons, or even decomposing corpses overrun with worms in the transi tomb, became common in northern Europe, and may be found in some funerary art, as well as motifs like the Dance of Death and works like the Ars moriendi , or "Art of Dying". It took until the Baroque period for such imagery to become popular in Italy, in works like the tomb of Pope Urban VIII by Bernini (1628–1647), where a bronze winged skeleton inscribes the Pope's name on a tablet below his enthroned effigy. As cities became more crowded, bones were sometimes recovered after a period, and placed in ossuaries where they might be arranged for artistic effect, as at the Capuchin Crypt in Rome or the Czech Sedlec Ossuary, which has a chandelier made of skulls and bones. Another influence may have been the octagonal Dome of the Rock in Jerusalem, not a mausoleum itself, but "the earliest Islamic model for centrally planned commemorative buildings", adapting the Byzantine form of the martyrium in a building standing alone, though on a stone platform rather than in a garden. In the Persian sphere, a tradition of relatively small mausoleums evolved, often in the shape of short hexagonal or octagonal domed towers, usually containing a single chamber, like the Malek Tomb. These single-chambered tombs developed into larger buildings in the Timurid and Mughal Empires,  like the Gur-e Amir tomb of Timur at Samarkand and the famous Mughal tombs of India, which culminated in the Taj Mahal. The Mughal tombs are mostly set in a large walled charbagh (chahar-bagh) or Mughal gardens, often with pavilions at the corners  and a gatehouse. The Taj Mahal is atypically placed at the end of the garden, backing onto the river Yamuna; a central placing is usual. They may have minarets, although they do not normally function as mosques. The Tomb of Jahangir lacks any dome,  while the Tomb of Akbar the Great has only small decorative ones. Other Islamic Indian rulers built similar tombs, such as Gol Gumbaz. Other parts of the Islamic world reflected local techniques and traditions. The 15th-century royal Tomb of Askia in Mali used the local technique of mud-building to erect a 17-metre-high (56 ft) pyramidal tomb set in a mosque complex. At the other end of the Islamic world, Javanese royalty are mostly buried in royal graveyards such as those at Kota Gede and Imogiri. 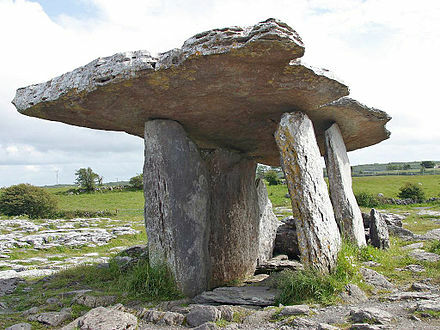 ↑ See for example the chapter "Tombs for the Living and the Dead", Insoll 176–87. ↑ Hammond, 58–59 characterizes disarticulated human skeletal remains packed in body bags and incorporated into Pre-Classic Mesoamerican mass burials (along with a set of primary remains) at Cuello, Belize as "human grave goods". ↑ See any well-regarded survey of the history of art or of architecture, such as Gardner's Art Through the Ages or the most recent edition of Sir Banister Fletcher's A History of Architecture. ↑ Lindley, Phillip (2007). Tomb Destruction and scholarship: medieval monuments in early modern England. Donington: Shaun Tyas. p. 3. ISBN 978-1900289-870. ↑ Cockerham, Paul (2008). "Reformation, reaction, reception: a 21st-century view of monumental destruction". Church Monuments. 23: 137–41 (137). ↑ Toynbee, 47–48, on Ancient Rome. Stewart and Rawski's book is entirely devoted to Chinese ancestor portraits. See Chapter 1 etc. ↑ Although the purpose of megalithic structures is not always clear, and of the very oldest, while Nevali Cori in Turkey contains burials, Göbekli Tepe appears not to. ↑ Robins, 51–55, 66–71, 218–19, and see index for other periods. Tomb styles changed considerably over the course of Egyptian history. ↑ Boardman, 126–27. Apart from those at the Mausoleum of Halicarnassus article, there are several from Lethaby's 1908 work here, and one illustrated in Boardman. ↑ Petersen, 95–105; see also Boardman, 240–41 on Eurysaces' tomb. ↑ Unesco Royal Tombs of the Joseon Dynasty. ↑ See Taylor for discussion. ↑ Davies, Serena (23 August 2004). "Viewfinder: Aboriginal burial poles". The Daily Telegraph. London. Retrieved 21 April 2010. ↑ Montillo, Roseanne (2009). Halloween and Commemorations of the Dead. New York: Infobase. pp. 41–42. ISBN 978-1-60413-097-3. ↑ Dowman, 54–55 for the Potala, and see index for other locations. ↑ Toynbee, 48–49. An exception in the Classical World were the Lycians of Anatolia. There are also the Egyptian mortuary-temples, where the object of worship was the deified royal person entombed, but Egyptian temples to the major gods contained no burials. For an extreme example, see ancient Delos. ↑ It was allowed in times of plague however. See Cremation in the Christian World for more details—the Orthodox churchs still forbid cremation. ↑ Board of Trustees for The Hofkirche in Innsbruck. ↑ Though they are exceeded in scale by Gothic revival monuments like the Albert Memorial and the Scott Monument, neither containing a tomb. ↑ Piponnier and Mane, 113 for the origins of mourning clothes. ↑ See for example Michalski, xi. Here Michalski refers to this rejection of religious imagery within Calvinism as "iconophobia". See also Gäbler, 72, 76–77 and Potter, 130–31 regarding the religious disputations in Zürich (1523) concerning (among other things) the removal of statues of saints and other icons. Participants included Leo Jud and Huldrych Zwingli. ↑ Berresford, 77–78 on "Liberty" (Italian term for "Art Nouveau") and 99–104 on Art Deco. ↑ Ruggles, 112 and 122. Her Chapter 10 includes a detailed description of the Taj with special reference to its gardens. ↑ An interesting contrast with the Taj Mahal, given they were both built by Shah Jahan. 1 2 The New York Times, Khomeini's Tomb Attracts Pilgrims, Philip Shenon, Published: 8 July 1990, accessed 25 April 2010. ↑ Levey 1975, 29–33 on Bursa, 83–84 on Istanbul; all the leading Ottoman tombs are covered in the book. ↑ Tomb of Askia, UNESCO page with aerial view. ↑ See Fletcher and Cruickshank, 596. The madrassa is labeled "the ultimate achievement of architectural development in Cairo" and its tomb chamber described as "immense." ↑ Mosse, 103–106 on conservatism, and generally throughout Chapter 5 on war memorials. ↑ Carrier, 19–22; Benton throughout, especially p. 194. ↑ Benton throughout, especially Chapter 1 on Soviet War Memorials (pp. 12–13 on Socialist Realism), but also noting deviations in the Warsaw Pact satellites, as on p. 194, and Chapter 7 on West Germany. ↑ Carrier, throughout, especially Chapter 8. See also the copious literature on the Washington Vietnam Veterans Memorial. The ancient Egyptians believed that a soul was made up of many parts. In addition to these components of the soul, there was the human body. 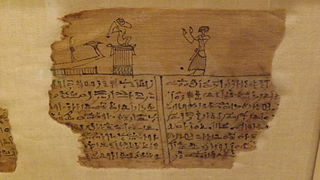 The Book of the Dead is an ancient Egyptian funerary text, used from the beginning of the New Kingdom to around 50 BCE. The original Egyptian name for the text, transliterated rw nw prt m hrw, is translated as Book of Coming Forth by Day or Book of Emerging Forth into the Light. "Book" is the closest term to describe the loose collection of texts consisting of a number of magic spells intended to assist a dead person's journey through the Duat, or underworld, and into the afterlife and written by many priests over a period of about 1000 years. The ushabti was a funerary figurine used in ancient Egyptian religion. 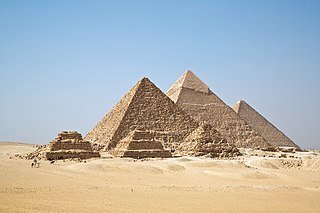 The Egyptological term is derived from Ancient Egyptian: ㅱ㈙ダ㏏㏭〾wšbtj, which replaced earlier ㆷ㍯ダ㏏㏭〾 šwbtj, perhaps the nisba of ㈙㍯ダㆭ šwꜣb "Persea tree". Geometric art is a phase of Greek art, characterized largely by geometric motifs in vase painting, that flourished towards the end of the Greek Dark Ages, circa 900 BC – 700 BC. Its center was in Athens, and from there the style spread among the trading cities of the Aegean. The Greek Dark Ages are also called the Geometric period in reference to this characteristic pottery style, although the historical period is much longer than the art-historical period, being circa 1100 – 800 BC. The vases had various uses or purposes within Greek society, including, but not limited to, funerary vases and symposium vases. In the burial practices of ancient Rome and Roman funerary art, marble and limestone sarcophagi elaborately carved in relief were characteristic of elite inhumation burials from the 2nd to the 4th centuries AD. At least 10,000 Roman sarcophagi have survived, with fragments possibly representing as many as 20,000. 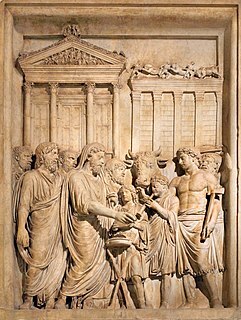 Although mythological scenes have been mostly widely studied, sarcophagus relief has been called the "richest single source of Roman iconography," and may also depict the deceased's occupation or life course, military scenes, and other subject matter. The same workshops produced sarcophagi with Jewish or Christian imagery. Early Christian sarcophagi produced from the late 3rd century onwards, represent the earliest form of large Christian sculpture, and are important for the study of Early Christian art. Ancient Egyptian retainer sacrifice is a type of human sacrifice in which pharaohs and occasionally other high court nobility would have servants killed after the pharaohs' deaths to continue to serve them in the afterlife. In Egypt, retainer sacrifice only existed during the First Dynasty, from about 3100 BC to 2900 BC, slowly dwindling, and eventually dying out. 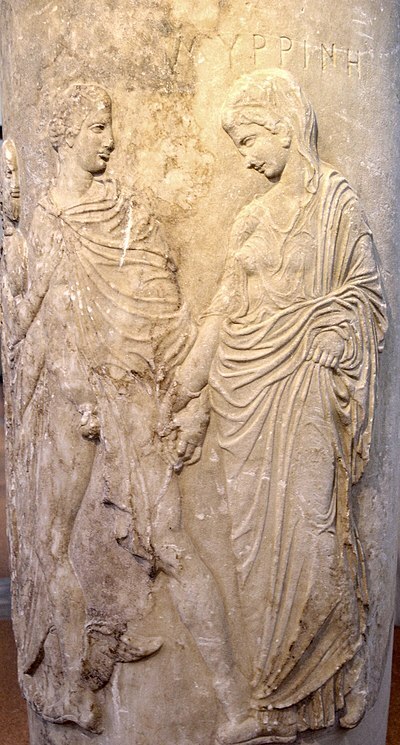 Roman funerary art changed throughout the course of the Republic and the Empire and comprised many different forms. There were two main burial practices used by the Romans throughout history, one being cremation, another inhumation. The vessels that resulted from these practices include sarcophagi, ash chests, urns, and altars. In addition to these, buildings such as mausoleums, stelae, and other monuments were also popular forms used to commemorate the dead. The method by which Romans were memorialized was determined by social class, religion, and other factors. While monuments to the dead were constructed within Roman cities, the remains themselves were interred outside the cities. Hammond, Norman. Social Patterns in Pre-Classic Mesoamerica . Washington DC: Dumbarton Oaks Research Library and Collection, 1999. 49–66. ISBN 0-88402-252-8. Accessed 22 March 2010.